If there ever was a picture that epitomised our Australian experience it would have to be this one. 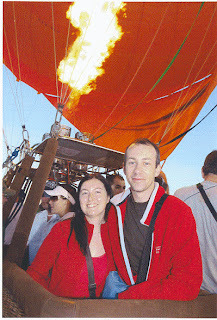 Hot Air Ballooning in the Atherton Tablelands, was one of the highlights of our stay in Australia, and I would have no hesitation in recommending it to anyone. We read our tour coupon a few nights before the trip and prayed that the time of collection was a typo. It wasn't, we set our alarm for 3.30 am and were waiting outside our motel half an hour later. The weirdest thing was that we weren't alone. Like I said Cairns is not the place for sleep ins. We were a little confused about the pick up time and decided that it must be a dawn hot air ballooning experience, well it was either that, or we were going to pick up people at various hotels along the way for the next five hours. As it happens we were wrong on both counts. The next picture actually demonstrates the reason. The answer, thermal activity. They have to fill the hot air balloons while there is no thermal activity otherwise the sun rises, heats the earth, and generates wind. The balloon when it is on its side acts like a sail, so if the winds are very strong it's goodbye to your balloon! I am not sure how all this works as it is dark outside as I write this post and the wind sounds like it could blow the roof off at any minute. I am also too lazy to "Google" it, but according to our tour guide that's the reason. Some cynic, when I recalled the story, suggested it might be cheaper! Here's a few pictures taken from the air looking towards Terra Firma. 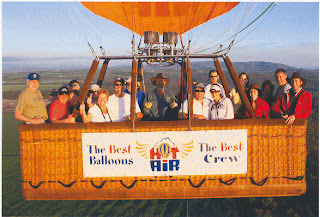 The Atherton Tablelands is one of the best places for hot air ballooning because of the climate conditions. They can fly an average of 300 days a year which can only be equalled in one other place in South Africa. The balloons we were flying in were the second biggest in the world and could hold 24 people. There is only one balloon bigger and it can hold 30, you might know it, an English guy by the name of Richard owns it! Here's a few pictures taken from the air with the landscape in the background. One of the highlights of the day is the anticipation when you arrive to the take off site, which varies with the direction of the wind. We were there with another company and there were a total of six balloons taking off at the one time. Here's a few more abstract pics of the balloons as they were taking off. You could fly for either 30 or 60 minutes depending on your budget. We did the 60 minutes, but 30 minutes gives you the full experience, as ironically it's watching them get the balloons ready that's the real fun. The only disadvantage with 30 minutes is that you spend the other 30 in a bus "chasing" the balloons in the air. That's the interesting thing about hot air ballooning, you go where the wind goes. So they never know where they are going to land and have to pick a starting point based on the prevailing wind. We finished up with a "champagne breakfast" in an Aboriginal cultural centre near by, where they had a stall selling photo's they had taken from the air. We of course bought them, but in fairness we didn't buy the T shirts. Some people never miss a marketing opportunity! What you cannot see from the photo is the amount of sweat pumping off the pilot. It takes a lot of hot air to lift 20 people.